Although mostly today sending flowers is a completely acceptable practice after the loss of someone, there are still some areas of etiquette to be noted. This is especially for some religions where knowing tradition can help your choices. When someone close to you passes away you will naturally want to express your condolences. It might be a family member, a close friend or someone related to a friend. You're going to want to send them flowers. Deciding on what type of arrangement you should send will depend on how close you were to the deceased and/or their family. The truth is there are no universal rules on what is appropriate when it comes to sending flowers, but you do want to be confident that the arrangement you choose conveys the right message. A funeral is an occasion where people come together to celebrate a life. No matter which floral arrangement you choose you will want to include a card with a heartfelt handwritten note inside. At this time, the family needs to be comforted and something like this can lift their spirits. In doing this you do not want to go overboard by sending a stuffed animal or balloons with your flowers. A beautiful card with a sincere expression of your condolences tucked inside the floral arrangement is perfect. When selecting your floral arrangement you may want to consider the faith and culture of the family and the deceased. Every culture has their own unique customs and what might be perfect for one culture may be inconsiderate for another. If you simply do not know then it's perfectly appropriate to ask for advice from someone in the family that you feel close to. Baha'i - Most types of flowers and floral arrangements would be perfectly appropriate. Buddhist - Most any type of floral arrangement or flowers would be appropriate. Catholic - Most flowers and floral arrangements are perfectly acceptable. Christian Protestant - Most flowers and floral arrangements are sincerely welcomed at both events, the memorial service as well as the funeral. Greek Orthodox or Eastern - An arrangement with white flowers would be favored, however, most any type of flowers are acceptable. Hindu - Garlands are actually more common and preferred at a Hindu funeral, although flowers or floral arrangements would not be turned away. Jewish - Although some of the more modern Jewish funeral services display flowers at the entrance or doorway of the synagogue, our suggestion is that you not send flowers to the funeral home. It would be better to send your floral arrangement to the home of the family member you are closest to. If you have any doubts about what is appropriate, a nice fruit basket can be sent instead. Mormon - Most flowers and arrangements would be appropriate, but do not select an arrangement that includes a cross or crucifix. Muslim - It would be best to inquire of a family member before sending flowers. The appropriateness of flowers is not consistent among families practicing the Islamic religion. There are many in this religion that would prefer that money be donated to a specific charity instead of sending flowers. If you do decide to send flowers, choose something elegant and simple. Immediate family includes parents, grandparents, wives, husbands, sisters, brothers and children. They can choose any kind of flowers or floral arrangements they like best. However, there are some types of flowers that are more appropriate for immediate family members. You have to realize that the flowers from the immediate family are usually placed next to the casket at the viewing or at the wake. There are also instances when the family requests flowers be placed inside the casket alongside the deceased. 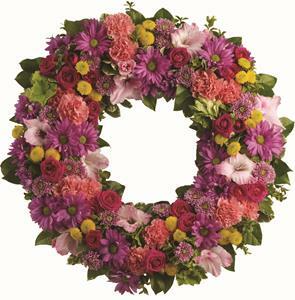 A wreath or casket spray is typically ordered by the immediate family. The other types of floral arrangements that some immediate family members (usually parents, spouse or children) select include swags placed inside the lid of the casket, table arrangements, and floral arrangements in the shape of a heart. Extended members of the family would include uncles, aunts, nephews, nieces and cousins and even dear friends have a wide range of choices. A traditional standing spray of flowers is popular as it makes a really nice presentation. More informal arrangements are nice choices too since they are more portable can return home with immediate family members or perhaps be taken along to the cemetery to adorn the gravesite. It is natural for close friends, acquaintances and business associates would want to send flowers to express their condolences and to let the family know they are sending thoughts and prayers during this period of grief. There are many choices for friends which include less formal wreaths, standing sprays, floral arrangements in baskets, vases containing bouquets and even live plants that can be taken home by family members once the funeral is over. It is perfectly appropriate for friends and business associates to send flowers to the funeral home or directly to the home of a family member. For business associates, it is perfectly fine to have flowers delivered to the family member's office. When placing an order for flowers to be sent to a home or office, it is always nice to choose a pretty basket or vase so that it can be used again. Standing sprays, wreaths, and floral arrangements in disposable containers are typically meant to be displayed at the funeral home only. We are frequently asked by someone if they should send flowers directly to the funeral or the memorial service and if so they want to know what kind of floral arrangement is appropriate. Our quick answer is that they can have flowers delivered right to the funeral home of if they wish, to the home of a family member of the deceased. In circumstances when the family has asked that a donation is made to a certain charity, that request should be honored. Flowers sent for a funeral should be appropriate to the religion, customs of the culture and according to personal preference. There are beautiful arrangements that come in bowls, vases or in the form of wreaths. Most florists are happy to deliver the flowers wherever you request, to the funeral home for the visitation, to the gravesite for the burial, or to the home of a family member. Our thoughts and our prayers are with you now in your time of grief. Please accept our condolences and know you are in our hearts. You are in our prayers and want you to know how much (name of deceased) was treasured and loved. We will never forget (name of deceased) for (his/her) kindness and generosity toward so many people. (He/she) will always be in our hearts. When family members request that friends and associates make a donation to a certain charity instead of sending flowers, honor their wishes. Send the donation in the name of the deceased and follow-up with a note letting the family know what you have done.